As much as we love turkey, it's never too early to get in the Christmas spirit. Jingle all the way to Baltimore from mid-November through the end of December to celebrate the holidays on the waterfront with these seasonal events. Skate with the best views in Baltimore at the PANDORA Ice Rink. The holiday rink includes a skate shack, rentals, concessions and entertainment. Keep an eye out for special events like Skatefest, as well as learn-to-skate programs throughout the season. Nov. 13-Jan. 18. Tickets range from $7 to $9, with season passes available. 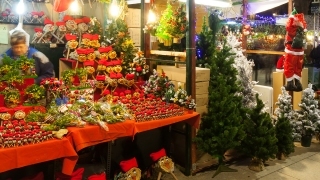 Visit West Shore Park as it's transformed into a traditional German Christmas market. Browse more than 40 vendors for traditional European crafts, arts and jewelry that make perfect holiday gifts. Food, sweets and drinks will also be available, as well as special holiday-themed programming each weekend. Nov. 26-Dec. 27. Admission is free weekdays and ranges between $1 and $5 on weekends. Print a coupon here. National Aquarium's Holiday 4-D Experience: "The Polar Express"
Make all your childhood dreams come true. Hop aboard "The Polar Express" for a 4D trip to the North Pole, and breathe in the aroma of hot cocoa in the National Aquarium's 4D Immersion Theater. Nov. 13-Jan. 3. Movie tickets are $5 extra when purchased with general admission. As our favorite elf once said, "The best way to spread Christmas cheer is singing loud for all to hear." Luckily, every Wednesday in December brings a new musical delight with the Merriment & Melodies Choral Arts Series. Enjoy hot chocolate while marveling at holiday stilt walkers and acrobats. Fit in some holiday shopping with special retail events and extended hours. Dec. 2, 9 & 16. Festivities begin at 5:30 p.m. Still looking for more? Check out the whole list of waterfront events.